Whom do you plan to vote for in the U.S. presidential election? Are geoscience issues (e.g. energy policy) a major factor in your decision? 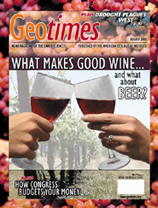 Geology and grapes connect in complex ways to produce the perfect glass of wine. In a recent taste test, English sparkling wines bested French Champagnes  perhaps heralding a worldwide trend linked to global warming. Probing below the ground can help winemakers better understand what makes their grapes tick. Geology and Beer: It's in the water; What's in a name? A 17-year-old from Fort Meyers, Fla., blew the competition away with her seafloor volcanism project at the recent Intel International Science and Engineering Fair. Even in the wet northeastern United States, vineyards need some extra protection against times of drought. The scientific community must champion itself to promote greater recognition and funding of its programs. Policy-makers need to stop dragging their feet when it comes to passing the federal budget. Earthquake country and wine country collide in California — making for good drinking and high-risk living. Geology plays a powerful role in the development of high-quality wine grapes, and in turn, high-quality wine. Photo of the wine grapes is courtesy of the Wine Institute. Photo of the Chabot Vineyard, Glass Mountain, Napa Valley, is courtesy of David Howell. Cover created by Mark Shaver.